Make exercise convenient with this fantastic six-piece set. Youll get weights, hand grips, jump rope, and thigh exerciser that fit neatly in the hanging display pouch. 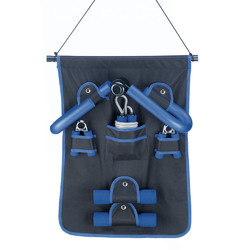 Hand weights: 8 5/8" long; hand grips: 5" long; jump rope: 117" long; thigh exerciser: 19" long; display carrier: 20¼" x 24". Item weight: 7.4 lbs. Iron. UPC: 849179021788.